1 of 5 In a medium bowl, whisk flour, baking powder and salt. Set aside. 2 of 5 In a large bowl, beat butter and sugar until smooth, about 2 minutes. Beat in egg and vanilla. On low speed, beat in flour mixture until just combined. Divide dough in half and form each half into a disk. Wrap in plastic wrap and refrigerate for 4 hours or overnight. 4 of 5 minutes, until lightly golden around edges. Remove cookies to wire racks to cool completely. 5 of 5 Repeat with remaining half of dough. Gather scraps and refrigerate. Re-roll and cut into additional trees. Bake and cool as above. 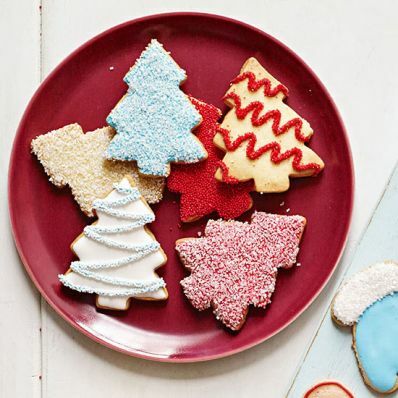 Decorate with Frosting (see Peppermint Mittens, below) and nonpareils. When dry, cookies may be stored in an airtight container up to 2 weeks. Per Serving: 8 g carb., 1 g pro., 0 g fiber, 16 mg sodium, 2 g sat. fat, 13 mg chol., 3 g Fat, total, 60 kcal cal.